For every avid electronic music fan, there will always be this intense desire to make his passion reality, but only a few can succeed. 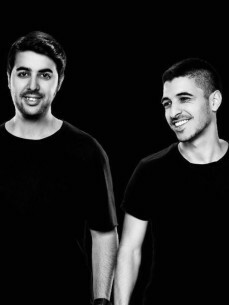 Both in their mid-twenties and united by the same vision and passion for House music that consumed their teenage years, their inauguration to everything related to electronic music, made this extraordinary talented pair to combine forces and transform their enthusiasm and passion for art and creation. Our journey began in early 2012, classmates for college of music, Ben Azoulay and Saar Lagziel, found themselves bonded by the hungar to create their own unique signature, what has started as a part-time spark of enthusiasm, has become an integral part of their daily lives. In a short but sharp sweep, the budding duo has already proven their worth on many levels. Leaping from the biggest club scene in Tel-Aviv, to the dominant venues, events and festivals across the country, debuting their first performance at the biggest students festival in Israel and only a month later, at the Ultra Europe's radio stage, conquering everything from the tinest dance-floors to the colossal main-stages, leaving their essential electronic mark that distinguishes them from most of the scene. It’s been a rapid rise to the top for Israeli talented pair Teamworx, which is testament to their tireless work ethic. Debuting for Sony Music Sweden their first progressive-house vocal single 'Levitate', their first essential stab a the charts, stepping into the top #50 on Beatport on their very first release, gaining the support of iconic electronic acts such as New World Sound, The Chainsmokers, John Dahlback and that's just the tip of the iceberg.